Open the Call window (Control-Shift-C) from the Phone Amego menu and begin typing the first or last name of the person you want to call. 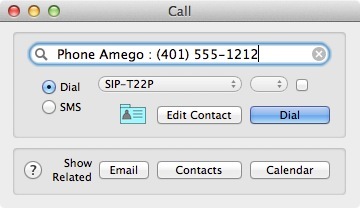 If the name is in your recent history or Address Book, Phone Amego will suggest possible completions in a pop-down menu. The pop-down search menu will contain your recent call history before you begin typing. You can press Edit Contact to open the corresponding Address Book entry or Option Edit Contact to create a new one if needed. Press Dial or return to dial the number shown. If you are dialing for a modem connected landline phone, pick up the phone first, or immediately after dialing while the call is "Connecting". Clicking the rolodex card icon will open a Phone Amego contact card for this caller allowing you to update any information and keep notes as desired. The card icon will appear in color if there are previous notes for this contact. You can use the Call window hot key (Control-Shift-C) as a convenient way to search for a contact card. From a contact card, you can call (or Email) that contact directly using any of the numbers listed. You can search for and show related items in Apple's Address Book, related messages in Mail, or related appointments or calls in iCal (when iCal logging is enabled). If a client calls you for example, you can see at a glance when you last spoke or the time of your next appointment. For devices that support more than one line, you can select the desired outgoing line. You can also select whether the call window should close automatically upon dialing or remain open.